The old Civic Auditorium and Civic Ice Arena — long ago renamed — are among the few survivors of the Mercer area that also included the storage area for the city’s trolley cars. I IMAGINE THAT many Pacific NW readers will remember this parking lot filled with municipal buses. It was not so long ago. However, few are likely to recall the earlier and regular overnight visits here of the city’s yellow-orange trolleys, scores of them packed side by side on parallel tracks. 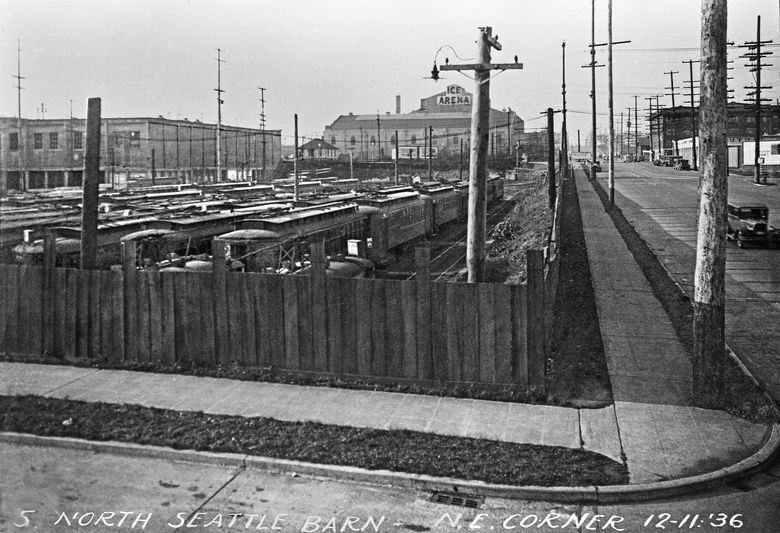 This North Seattle Storage Yard was built in 1906 by the Seattle Electric Company, the transportation “octopus” that by then had consolidated most of the city’s independent trolley lines and also kept building new ones while Seattle grew like an adolescent. The brick car barn, upper left, was added in 1907 for trolley repairs. By 1910 the expanding system had yards and barns in Fremont, Georgetown and at 14th Avenue and Jefferson Street. As the original print reveals at its base, this look west over the parking yard was photographed on Dec. 11, 1936. The “N.E. Corner,” captioned bottom right, is at Sixth Avenue North and Mercer Street, which is on the right. The Auditorium Apartments, the dark four-story brick construction at the northwest corner of Fifth and Mercer, is partially hidden behind the power pole on the far right. This apartment house, with two exceptions, is the only notable building (from this prospect) that has survived from the “then” into Jean Sherrard’s “now.” The two exceptions are Civic Auditorium and its linked neighbor, the Ice Arena. And in 1936, from this point of view, Civic Auditorium seems to be named the Ice Arena. 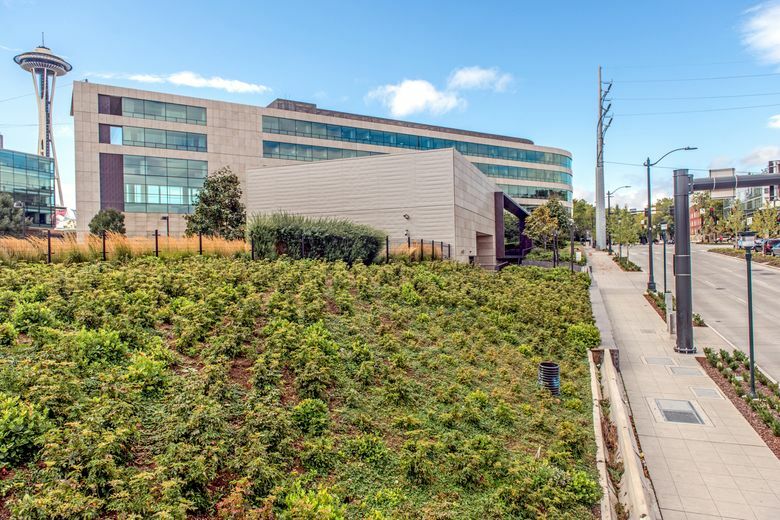 However, the sign to the left of the stubby power pole is not posted on Civic Auditorium, but rather stands on the roof of the auditorium’s attached neighbor to its east, the Ice Arena (now Mercer Arena). The auditorium, built in 1927-28, has gone through two elaborate makeovers: first as the Opera House for the 1962 Seattle World’s Fair and again in 2003 as McCaw Hall. On this Friday night of Dec. 11, 1936, the Ice Arena was booked for the first night of two with the Nile Temple Shriners Ice Carnival, which featured Shriners in their “vivid costumes, freak acts and comedy performances,” sharing the ice with “some of the finest exhibition skaters in the world.” This was also the season when the Ice Arena’s offerings switched from the faked, if often bruising, melodrama of professional wrestling to ice, with the city’s well-outfitted amateur skaters and a professional hockey club. Devoted Seattle sports fans will know that the professionals then were also called the Seattle Seahawks.